(Please note: the fill levels for all six of the following Signatory minis were in the neck. Four years ago, blogger Oliver Klimek said "Who needs Brora and Port Ellen when we have Clynelish and Caol Ila!" In less than a year after this post well-aged single cask Caol Ila prices doubled or tripled. That of course had nothing to do with the fact that all long-matured whisky prices were exploding at that point time (and continue to). Instead, I think we can all agree that it's Oliver's fault. Gee whiz, thanks, Oliver. In 1983, DCL (proto-Diageo) closed the old Port Ellen distillery, but kept the larger, more modern Caol Ila distillery open. Thirty years later Port Ellen has become the Karuizawa or Stitzel-Weller of the Scotch whisky industry. Or have Karuizawa and Stitzel-Weller become the Port Ellens of the Japanese and American whisky industries? More to the point, Port Ellen bottlings were highly sought after and are super duper duper duper expensive. Notice the change in verb tense there: were/are. No one except for those with the bankroll to buy a three thousand dollar whisky bottle actually chase any of the Port Ellen bottlings at this point in time. Meanwhile, Caol Ila keeps on beep-boop-beeping its software-run production along, often cranking out some very good stuff. And though the independent bottlings of older Caol Ila are no longer affordable to the majority of whisky fans, those whiskies can be had for less than the price of one's mortgage. What a bargain! 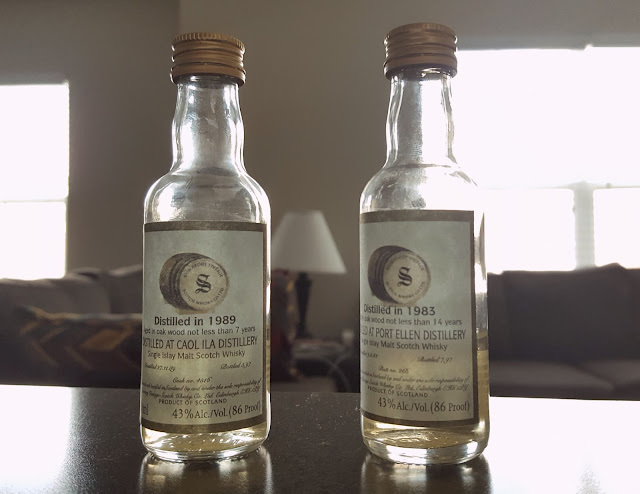 So I found myself with one Caol Ila, distilled back in the '80s and younger than its official Diageo bottlings, and one Port Ellen, also from the '80s and at half the age of anything Diageo or the indies can now bottle. With their straw color they both appeared to have been aged in refill casks, thus possibly very spirit-forward. Clearly the responsible thing to do was to drink them side by side. The nose starts out with tar, roses, celery, and sheep(! ), followed by a solid menthol medicinal note. Then band-aids and a hint of mothballs. And the PVC-loaded baseball card sheets of my youth. The menthol shows up in the sharp and mineral palate as well. A good note of bonfire-scorched marshmallows lightens things up. A few Milk Duds too. The peat grows darker with time, its smoke getting heavier as it goes. Suddenly a BIG umami note appears and stays the course. The hum of peat runs through the finish. Sea salt, green bell peppers, and a tangy edge. Some graham crackers -- we have the whole s'mores here! A good length to it considering the age and abv. It's in good shape at this strength, but I'll add a little bit of water. All it took was a few drops to transform the nose. Grapefruits, cherries, roses, peat smoked molasses candy (Is that thing? Please be a thing. ), and candy canes. Umami takes front seat in the palate, reminding me of toasted sesame seeds and the great toasted seaweed I had in Japan. Smaller notes of cane sugar and bitter cocoa add complexity. The finish is loaded with umami as well, along with a hint of sweetness, and a nice spicy sparkle. While this may not work for every palate, it REALLY worked for mine. It was young without being harsh, had some fascinating complexity, and seemed nearly oak free. More importantly, it smelled and tasted great. I wish I could say that the current super young Caol Ilas I've tried recently were at least half as good as this. But they weren't. I would also like to point out that all of the quality here is delivered via a 43%abv. Though I thought I could yell "First!" for a review on this cask, Serge reviewed it twice (here and here), liking it considerably less than I, and finding different notes to it. Though his buddy Davin (Mr. Canada?) gave it an 87, so listen to Davin on this one. The nose has a little of the menthol note as well. Some fresh plums and peaches. Plaster and something more than vaguely ureic. The palate has a sweet malty start that quickly fades behind raw, hot, salty spirit. It's a little woolly and maybe there's a hint of bacon. It has a very bland peat character, but even that collapses behind a violent bitter note. Ah, the roasted marshmallows make a cameo in the finish. Otherwise it's peppery ocean water, ashy peat, and a lot of bitterness. Well, the nose is a little fruitier. Maybe a bit of caramel and some peat. But, nope. Same quantity of pee. Luckily it all fades out relatively quickly. The palate is short on peat, which is a shame because the rest is mostly generic sweetness, bitterness, rough graininess, and a bit of cardboard. The finish is similar to the neat finish, though plainer. No, it didn't need water. It needed to be sent to blenders. Again, I thought I'd be the first to review this one, but nooooope, SV reviewed it too. He thought it was an utter turd (my words, not his). My sentiments are close to his, but I don't think it's a complete fail. It's just kinda bleh. Only once one gets over the shock of having a significantly subpar Port Ellen, can one see it's not a tragedy. It's just a mediocre whisky. Hey, I might be the blender it needed. This was not a disappointment thanks to the happy surprise that was the Caol Ila. My faith in that distillery's techno-spirit strengthens every year. In this instance, though its whisky was half the age of the more famous Islay's, the Caol Ila was rounder and richer, and even swam better. One can't assume that because the words Port Ellen appear on a bottle's label the whisky inside will be of considerable quality. That's a little message to those of you scouring auctions for lesser known PE bottlings. Perhaps some dusty Caol Ilas might bring the joy you're looking for, instead. At least they'll be cheaper. There has to be an alternate universe where DCL closed Lagavulin and Port Ellen is Ron Svenson's single malt of choice on Public Gardens and Amusements (yes I broke out the thesaurus for that joke).